Ever since he was four years old, senior Andrew Moglianesi has been playing soccer. 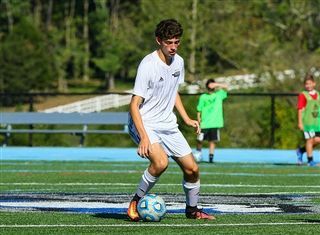 From town-recreation to travel to club, Moglianesi has grown and developed his soccer talents to become one of the senior leaders for the Knights squad. This past summer, he was able to take his training to a new level when he worked with the 17-18 Academy Team for Sevilla FC in Spain. "One of my dad’s good friends knows the Sevilla Organization really well and was talking to them about me," explains Moglianesi. "They then wanted to check out my soccer video to see how I play and where my technique level was, and they said I could come train with them for a week." 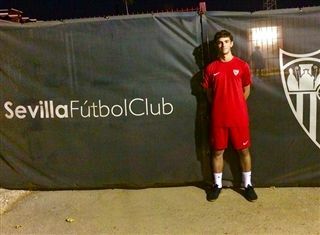 During the last week in August, Moglianesi trained with Sevilla FC Academy, one of the top teams in Europe. Every day the team worked on different instructional and agility drills in an effort to perfect their technique and scoring ability. For Moglianesi, who plays forward and currently has 16 career goals and six career assists with Gill, the focus on speed and scoring was ideal. "I really took in their style of play,” he said. “It was an honor to be with one of the best teams in Europe and learn from their players. Spain has some of the best history in the sport and to see how fast they play really showed me the importance of that aspect of the game." With this once-in-a-lifetime opportunity, Moglianesi is looking forward to using his experience to help the Knights this season. "We really want to win the conference and set our mark after moving up a division,” he said. “The main goal, however, is to always win states."